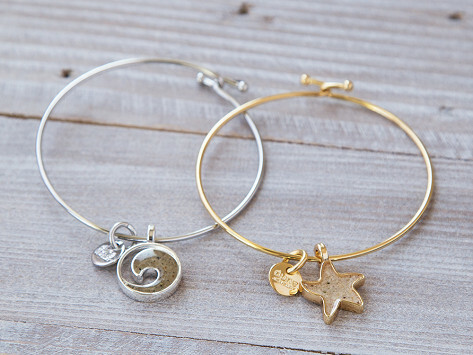 Capture and carry your favorite beach in a custom sand bangle. Dune Jewelry’s handcrafted sand jewelry encases grains from a special beach, golf course, ballpark, or trail to create a one-of-a-kind accessory. Send them a capsule of your own sand or choose from their collection of over 1,500 beaches worldwide. Dimensions: 3" x 3" x 0.1"
It is fantastically unique and dear to my heart ... so pleased with it! I got this for my mom for Mother's Day. Moonstone Beach is her favorite, and she absolutely loves the bangle!